Most people look back as the Carlylera (that’s “Carlyle era” conveniently shortened to make it more efficient) as a negative. “The team played in an unsustainable way”, people say. And sure, that’s probably true (although we’ll never know, as Carlyle’s time was unfortunately cut short). But there is something the Carlylera was good for: entertainment. The same can’t be said for the Mikera (short for “Mike Babcock era”) thus far. And this isn’t just my opinion. There is data to back it up. What data you say? A new analytic I am unveiling today that I call Boresi. It’s a way of calculating which teams are the most fun to watch, and which ones will bore you out of your mind. Being bored watching a hockey game is bad, as it is meant to entertain you. Two notes here: first, I sorted from worst Boresi to best to make the point more obvious that the Leafs are boring. Second, I didn’t include last night’s loss to Winnipeg because I felt it would skew the numbers too much from a one game sample. Please note: this time I ordered from highest-to-lowest Boresi rating, to drive home the point that the Leafs were way more exciting to watch last year. 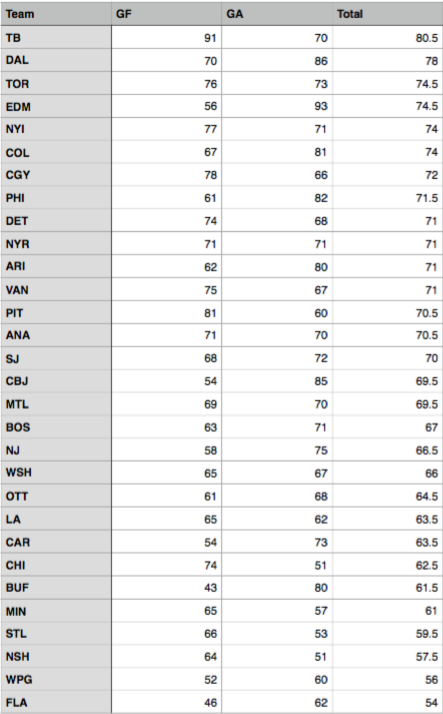 Their excitement-level was tied for third in the league with Edmonton, only behind Dallas and Tampa Bay. It’s plainly obvious in this chart that confirms my thinking. I wouldn’t believe it otherwise, but I trust the formula and the way it comes to its conclusions. The Carlylera may not have been the most “sustainable” (what does that even mean, really? ), but I’ll be damned if the hockey wasn’t the most fun. If you want, you can disagree. But the numbers don’t lie. If you read one hockey article, in your entire life, let it be this one. The Leafs have never looked so boring and bad. Nobody on the team is any good. It is pathetic. Yet nobody is fired. Kadri, JVR, Reilly, Phaneuf, all first round picks! Yet so boring and bad. Watching a rebuild rebuild a worse team doesn’t make sense for the future. Numbers don’t lie, but people extrapolating by just some of the numbers they skew the numbers. 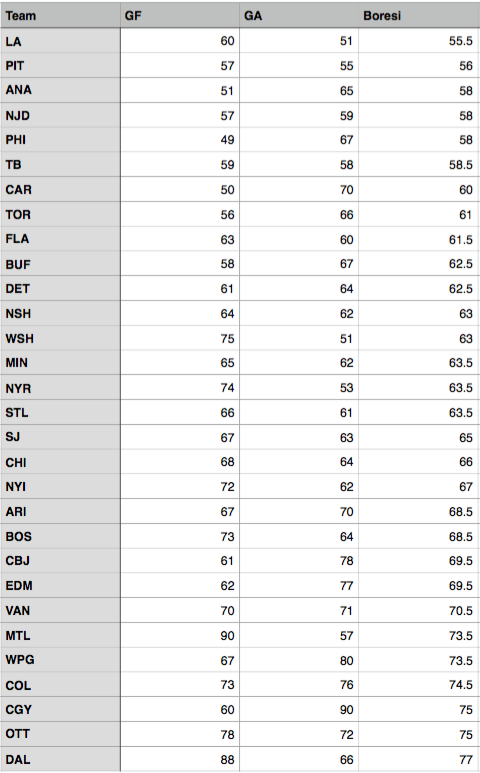 You didn’t put the whole story out there: puck possession, corsi, fenwick, +-(oh yeah, that is a bad stat) quality of opposition and how ever many more numbers are out there to choose from. But you sir chose TWO goals for and goals against. Sorry, not near enough basis on which to judge a team. That would be like judging your writing on the amount of negative/positive comments you got on an article, sorry this one is a minus for me. Since when do you need a stat to prove that the team is boring. Stupid Article. If you’re bored of watching the Leafs watch another team then Bobby. Booby your finest contribution to literature yet. Now I got to be honest and fair here, as that isn’t saying much considering your past gems of wisdom. I’m amazed that some other giant of statistical analysis didn’t beat you to the punch. My one major disagreement with you is that you show zero respect for my comrade Nikolai Borchevsky who in the glorious 1992/93 season produced 34 goals, nine more than that floater Phil Kessel scored last year, and 40 assists. The least you could do Booby is rename your genius statistical analysis as Borsky Damm I do think that is a better name as I’ll throw some beets and parsnips into it. Thanks for a good laugh. Sadly far, far too many fans will be up all night studying your new wonder system. But as you say ” The numbers don’t lie” Sometimes I wonder about you though.